A Place in Mind is the result of Avi Friedman's worldwide quest for successful environments where people congregate and feel comfortable. Whether he writes of the conviviality of a teahouse in Istanbul; the public art of Nunavut's capital, Iqaluit; the serenity of Assisi; or the architectural harmony of neighbourhoods in London and Amsterdam, Avi Friedman conveys his excitement at discovering people-friendly places-antidotes to social isolation. 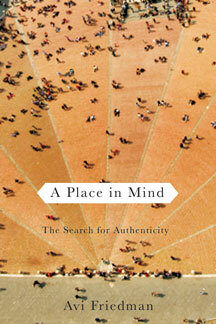 Searching for good places-authentic places-and wondering about the disappearance of others, are at the heart of A Place in Mind, as the author reflects on the design of markets, the evolution of building methods, the need for historic preservation, the relationship between cities and suburbs and the unraveling of human relations inNorth America. In each instance, the question is asked:why do these places work? Dr. Avi Friedman is the co-founder of the Affordable Homes Program at the McGill School of Architecture, where he is a Professor. The recipient of several research and design awards. Avi Friedman has published extensively in both academic and trade publications. He lives in Montreal, Quebec.